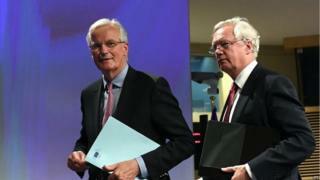 Brexit negotiators are to outline what progress has been made so far as the latest round of talks come to an end. 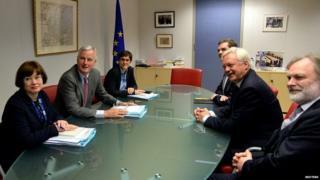 The UK’s Brexit Secretary David Davis and the EU’s Michel Barnier will meet to assess the past four days of talks. Groups of British and EU officials have been discussing citizen’s rights, the Irish border and separation issues, including UK financial liabilities. The EU has said talks won’t move onto the subject of future trading until it judges there’s been adequate progress. The two sides are meeting for four days each month, with this week’s talks aimed at scoping out points of difference and common ground in those areas that have been identified as requiring urgent attention. After the Brexit process was effectively put on hold during the UK general election, the process has moved up a gear this week, with 98 British officials engaged in different streams of work at one stage. The UK and EU have made separate offers on residency rights, each side saying they want an early agreement to give certainty to the three million EU nationals in the UK and the 1.2 million British expats on the continent. But both sides are adamant that any deal must be reciprocal. It has been reported that final agreement on the size of any so-called “divorce bill” that the EU believes the UK should pay is unlikely to be sealed until late 2018. So far at the least the Brexit negotiations appear to have been surprisingly leak-proof considering the sheer scale of the operation. A degree of exasperation appears to linger on the British side at the idea that its officials are less well-prepared than their EU counterparts – the UK believes its negotiators are just less inclined to work off detailed, published position papers. There have been hints of progress in talks on citizens rights accompanied by stronger hints that there’s still a long way to go – the EU insistence on a future oversight role for the European Court of Justice remains a stumbling block. David Davis and Michel Barnier will be closely watched for any discrepancies in how they choose to portray these first steps on a long road. The UK has said it will honour its membership obligations and pay what it is lawfully due but has rejected talk of paying “extortionate” sums of up to 100bn euros (84bn). Despite speculation about the possible sums involved, it has been reported that no official figures have yet been put on the table. Progress over the summer months will be closely watched as a sign of whether the two sides are on track to make sufficient strides by October’s EU summit to open parallel talks on future trading arrangements. Later on Thursday Theresa May will get round a table with business leaders in Downing Street to try and allay their concerns about the impact of the UK leaving the single market and customs union. The first meeting of a new Brexit business steering group comes amid fresh warnings about the cost to British companies of the UK leaving without a deal of any kind, which would see the UK default to World Trade Organisation global trading rules. A report from academics and experts at The UK in a Changing Europe says failure to reach agreement on the terms of the UK’s exit and its future trade relationship with the EU could cause “widespread” damage to the aviation, nuclear and pharmaceutical sectors among others. But, in a more upbeat message about the UK’s future outside the EU, International Trade Secretary Liam Fox will tell officials at the World Trade Organisation on Thursday that Brexit is an opportunity for the UK to “set its sights wider and embrace the realities of globalisation”. In a speech in Geneva, Dr Fox will highlight the potential benefit to the UK of further liberalisation in the global market for services, particularly in e-commerce and the digital industries. Liam Fox will praise the WTO’s role in liberalising global trade and tackling protectionism but it is also clear that contingency planning will be on his mind. Liam Fox believes it is in the interests of both the EU and UK to reach a post-Brexit trade deal but significantly he will point out that Free Trade Agreements are not the only way to promote commerce between nations and he will set out a range of other options. So if Britain were to leave the EU without a deal, he believes that as an independent member of the WTO, the UK could push for further liberalisation of trade in services and technology. It’s apparent that Liam Fox wouldn’t see a reliance on WTO rules as a disaster. However, the cabinet minister – who is in charge of laying the ground for post-Brexit trade deals with countries such as Australia, New Zealand and the UK – will warn of the rise in protectionist sentiment and the need to tackle impediments to free trade – particularly the growth in non-tariff barriers since 2010.